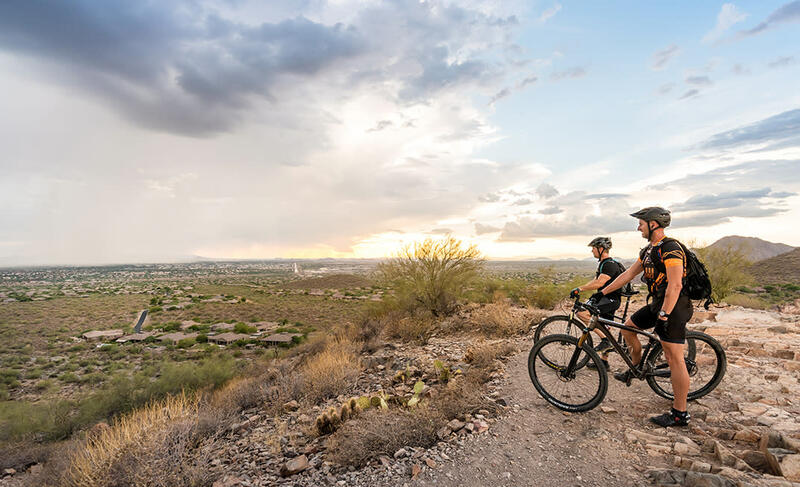 When the McDowell Sonoran Preserve was established in 1995, the intent was to protect a beautiful swath of desert and enhance the quality of life for Scottsdale residents and visitors alike. Mission accomplished. Within the 30,580 acres sheltered by the preserve, you’ll find incredible scenery, a network of trails and more than a few surprises. Balanced Rock, located near Granite Mountain, always comforts me. It has absolutely no business being upright, yet there it stands, a multi-ton, mushroom-shaped boulder, precariously perched on a foundation of bare stone. Completely exposed and alone in the desert, it serves as a reminder that seemingly impossible things exist. They’re all around if we just seek them out. Making the loop through the desert scrub surrounding Cholla Mountain, I stop to enjoy the ancient air-conditioning of Cathedral Rock. Just off the western flank of the mountain, mighty boulders are stacked together in a distinctive formation and pocked with shady grottoes. 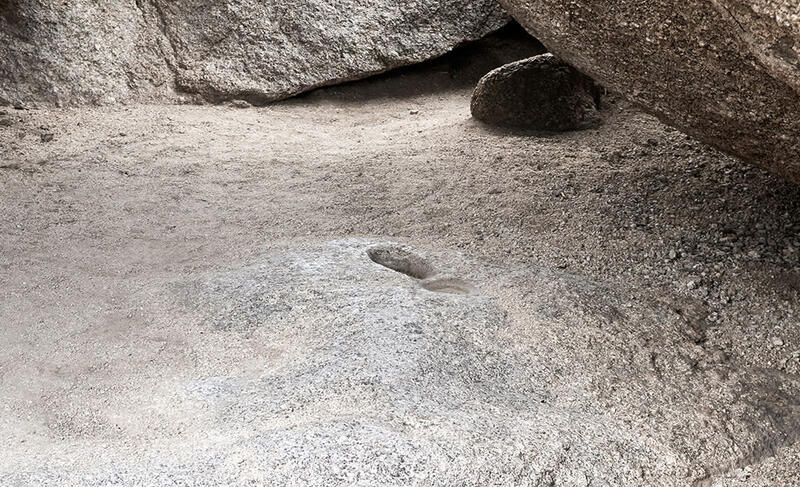 In the largest room, metates are still visible, the shallow indentations in the bedrock where Native Americans would grind food such as mesquite pods. The saguaro is the unquestioned king of the Sonoran Desert, towering over the landscape. Yet despite their royal status, few wear a crown. Those that do are called crested saguaros. 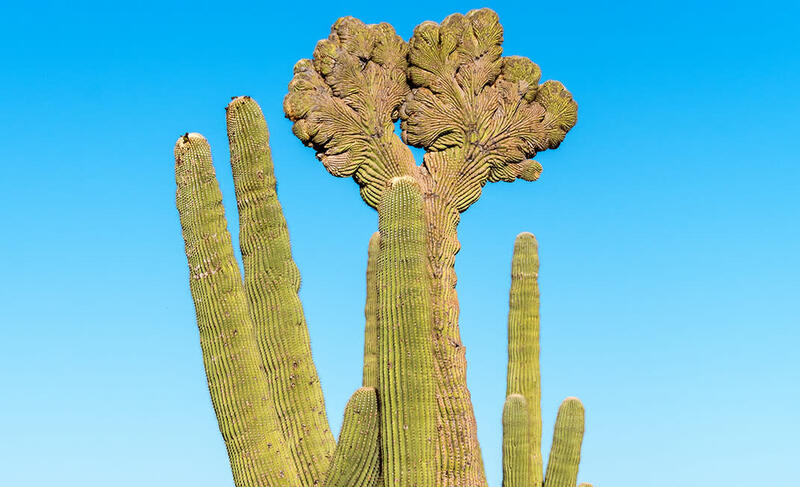 When the growing tip of a saguaro produces a fan-like shape instead of columnar arms, it’s referred to as crested or cristate. Biologists aren’t sure what causes the abnormal growth. The specimen standing at the junction of the Coyote Canyon and Desperado trails is one of the rarest. The main trunk forks, with both ends fanning out into a regal double crest. It’s beautiful and eerily reminiscent of Princess Leia’s twin-bun hairdo. Since Coyote Canyon is deep in the Preserve, it can only be reached from connecting trails. The closest access point is from the 136th Street and Dove Valley Road intersection. There’s no official trailhead parking but a slice of roadside space leaves room for two to three cars. 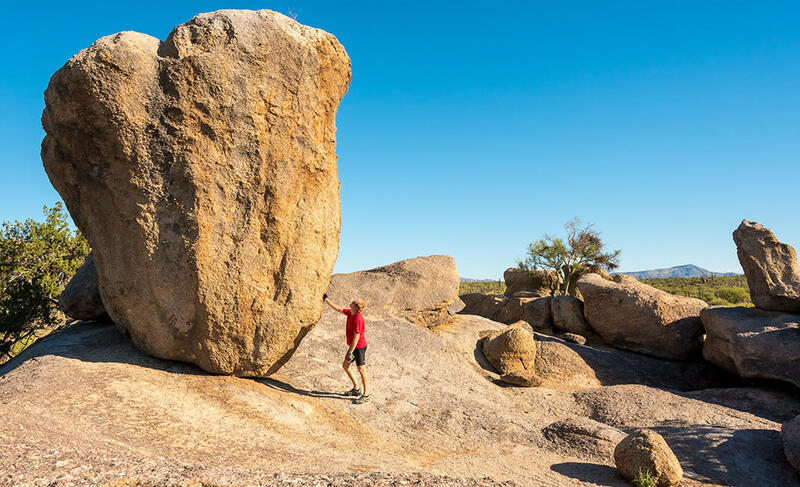 The boulders give shape to narrow Coyote Canyon and also provide it with personality. This is a canyon full of whimsy. It’s only a sliver of a defile but erosional forces have added flavor, carving a variety of shapes and faces into the rough skin of the granite. I notice eyes peering at me, and world-weary grins. This, I decide, is where the Easter Island heads go to retire. It’s easy to lose yourself on Lost Dog Wash Trail. It slips immediately into the embrace of mountains, leaving all trace of the city behind. Ramble through desert flora, crossing washes and making a gentle climb. Just as you forget there’s even a city nearby, you crest a ridge with signed overlook. 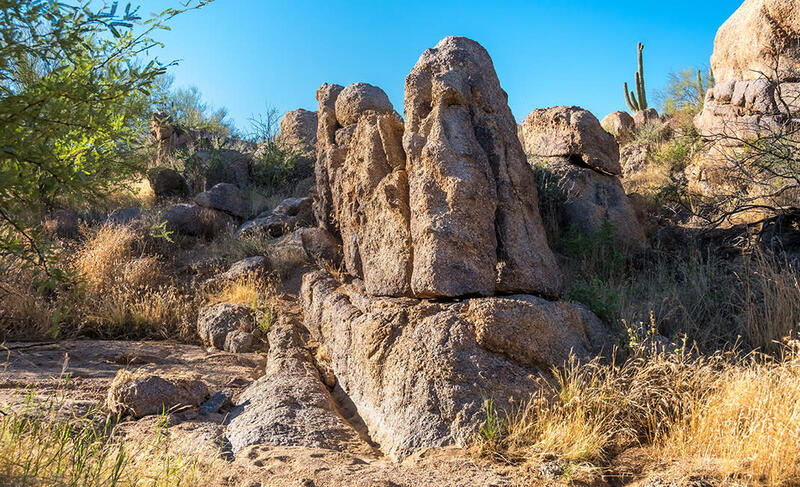 From this short path you savor views of not just the sprawling urban valley, but also Frank Lloyd Wright’s Taliesin West, the famed architect’s winter home and architectural school. Roger Naylor is an Arizona travel writer and author. His latest book is Boots & Burgers: An Arizona Handbook for Hikers.